On first glance, the wrappers on Mast Brothers chocolate bars appear better suited for a modern art studio or boutique furniture store than as the packaging on everybody’s favorite snack. Printed with artful, geometric patterns, they’re the visual antithesis to over-the-top Willy Wonka. You might imagine Mast chocolate bars sitting in the reception area of an open-concept tech start-up or niche design firm. The Iowa-bred brothers behind the brand complete it perfectly, sporting hipster beards and a pensive smolder in all of their promotional materials. As with so many Brooklyn projects these days, aesthetic is everything. Could it be the only thing? Since 2006, Rick and Michael Mast have sold, with considerable success, their line of artisanal chocolates for what they say lies inside the packaging: a one-of-kind, “bean to bar” gustatory experience. A major part of the Mast’s marketing relies on the idea that they handcraft their chocolates from scratch, starting with just a “big burlap sack full of beans” in their apartment. Speaking with Vanity Fair in February, the brothers called themselves the “poster boys for hipster to gourmet chocolate.” And why not? Their cookbook details a chocolate-making process that involves cacao beans shipped to Brooklyn from all over the world, roasted and ground using techniques perfected by the Mast’s own hands. “I can affirm that we make the best chocolate in the world,” Rick told Vanity Fair. This — along with many of the Mast’s other claims about their bars — is now being questioned as a result of a series of blog posts published on DallasFood.org in the past two weeks. 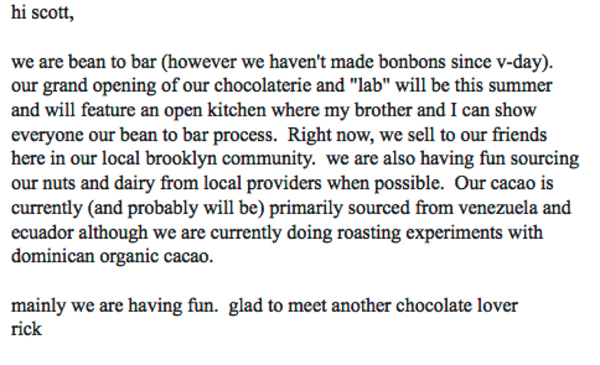 In a series called “What Lies Behind the Beards,” food blogger Scott Craig alleges that the entire Mast Brothers operation is a sham — that, in fact, the “bean-to-bar” trademark that made them famous in the early years was no more than remelted chocolate from another brand. Craig wrote in an email to The Washington Post that when a slate of chocolate makers entered the market from 2006 to 2007, he took an interest in all of them. After trying a few Mast bars, he reached out to Rick Mast with what he “thought were some fairly straightforward questions” about whether they made their own chocolate (inherent in bean-to-bar production) and received a vague response that raised his suspicions. Pulling together reviews, product descriptions, observations and expert commentary over the years, Craig concluded that in the early years of Mast Brothers production — from when they began selling to the public in late 2007 to at least late spring 2009 — the company remelted chocolate purchased from commercial French chocolate manufacturer Valrhona. In other words, the operation allegedly didn’t start out as bean to bar, despite the narrative the Mast’s built around the business’s humble, homegrown roots. Quartz reported Thursday that it has independently verified many of Craig’s claims. Mast Brothers declined The Post’s request for further comment Friday morning. But according to chocolate industry experts interviewed by Craig who also confirmed their statements to Quartz, the Mast brothers acknowledged that they used Valrhona chocolate, though their advertising didn’t reflect it. According to Craig, the single origin bars matched the Ecuador 66 percent cocoa, Venezuela 72 percent and Madagascar 64 percent couvertures (high-quality chocolate used by chocolatiers in remelting) from Valrhona’s product catalog that year. Those less versed in the rules of the chocolate industry might be wondering: What’s the big deal? After all, even the naysayers believe that Mast Brothers now creates most, if not all, of the chocolate used in its bars. Why does it matter — if the allegations are true — that the company started out by remelting? Understanding the severity of the charges Craig is leveling against Mast, requires an appreciation of what bean to bar means to chocolatiers. For chocolate artisans, bean to bar is the gold standard, one worn and earned by a dedicated few. It’s what justifies charging double digits for a block of cacao. Though an appealing facade, the early Mast Brothers was a Potemkin chocolate factory, churning out remolded, repackaged industrial couverture…The Masts did not become pariahs in the fine chocolate world because of their beards, publicity or product mediocrity. It was because of their lies.